There was the stellar fried chicken – with a perfect, fluffy layer of breading on the outside waiting to be pulled away to reveal succulent juicy meatÂ on the inside. And of course, the deliciously smoked BBQ and the spicy hush puppies. Yes, there were those. But no chili donut? That was a novelty item on the list to check off. Aaron didn’t disappoint. And why would he? He’s always experimenting with different creations and I’m just happy to be on the sidelines. This particular night he brought out the cheesecake donut (hole). He decidedly made the cheesecake filling creamier than cheesy to compliment the soft, hot and golden shell. Accompanying the dessert was a dark, rich chocolate sauce made to pour and berries scattered around the plate. I shut up. Perfect. Aaron did it again. Besides, I could always go for dessert. 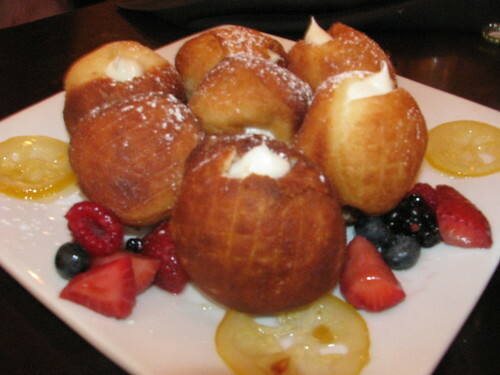 This entry was posted in Food, San Fernando Valley and tagged Aaron Robins, BBQ, Beer list, Boneyard Bistro, Cheesecake donut, Cheesecake-filled donut, Donut hole, Sherman Oaks. Bookmark the permalink.